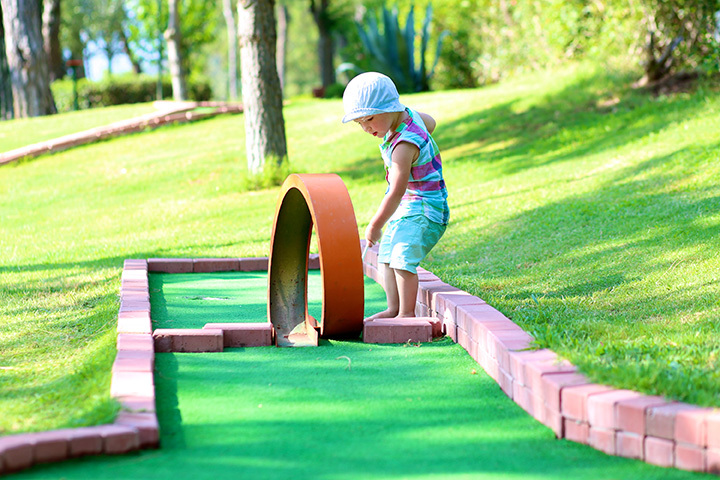 15 "one-of-a-kind" Mini Golf Courses you need to play! The sport of golf was invented in Scotland around 1457. Scotland is also where the slightly-less "sporty" game of miniature golf came to be. In 1867, the Ladies' Putting Club of St. Andrews was formed to give genteel women a day out on the links without breaking a sweat. Mini golf came to America in 1916, when the first course was built in North Carolina. During the Depression, miniature golf became a popular alternative to the much more expensive regulation version. Golfers could keep their short game sharp by navigating obstacles, water traps and other crazy hazards (hello, windmill). But, really --the silly mechanized devices appealed to pretty much anyone. Even though miniature golf is generally considered cheap family fun, there are actual official competitions where folks test their skills! Whether you're up for the challenge, or just want a goofy activity, here are 15 courses around America that are a guaranteed hole in one - for fun! True to the city's seafaring heritage, the glow-in-the-dark course has an underwater theme. You'll be surrounded by sunken pirate ships, ferocious sharks, turtles, dolphins - even a mermaid or two! It's been rated among the top courses in the world, partly for the extreme "kitsch" factor. Each of the 18 holes represents a different country, with challenges including hitting the ball through a series of pyramids or into a kangaroo's pouch. Having opened in 1930, this course is one of the oldest in the country. It's also on the National Register for Historic Places, so think about the thousands of folks who played it before you -and maybe uttered a few choice words after missing a putt. With tons of mini golf places on the Jersey Shore, this one is regularly ranked #1. There's an amazing pirate ship, animated characters, waterfalls, caves and more. You'll feel like Captain Jack Sparrow before you know it! It's an institution of this beach town, and offers both indoor and outdoor courses at a few locations around town. The Prehistoric Golf course at 68th street features challenging terrain and giant dinosaurs that will make you glad that they went extinct. The 18-hole course is called "Cowtopia" for obvious reasons: cow sculptures are everywhere! You'll be playing alongside colorful cows riding in a VW bus, sitting licking ice cream cones or an astronaut cow heading for the Milky Way. Naturally, there's a world-class ice cream parlor right next door. While working your way through either 18 or 36 holes, you'll be treated to massive volcanic eruptions, complete with fire plumes - because, why not? Also, the course wends its way through caverns and other volcanic themes. And you have the option of taking it up a notch by playing certain holes with your eyes closed or holding your club behind your back. Two 18-hole courses are built around the concept of, "Hey, we just crash-landed on a remote islandâ€¦.so why not play some putt-putt golf?" The theme features a giant plane and helicopter, waterfalls, greenery and some pretty challenging holes. Located in the Walt Disneyworld resort, this is one of two 18-hole courses. The Fairways is considered pretty challenging; you may not feel like it's "the happiest place on Earth" after tackling the sand traps and water hazards. It originally opened in the 1950s, but moved in the 1970s to this larger location. There are 19 moving obstacles in what's dubbed "the world's most unusual golf course." It's colorful and interactive, and players love how the golf balls get hoisted via things like rollercoaster, rocket or a replica of the Sears Tower. Miniature golf inside a funeral home: you can't make this stuff up. The original owner of the home had a large unused basement, so he installed a 9-hole course. Obstacles include things like headstones and coffins, and its open anytime a service isn't underway. This Biblical-themed course leads you through stories from both the Old and New Testament as you play 18 holes. Whether it's the Garden of Eden, Jonah and the Whale or other Bible stories, you'll need a higher power to navigate some devilish challenges. Players get an amazing underwater experience, with an indoor course built around a black-lit giant aquarium. Between the 3-D goggles and ocean soundtrack, you'll think you're "under the sea." It's a 14-hole course located inside an old Victorian building, and built around San Francisco history and themes. What's even better is the great bar and restaurant that's part of it. It's the biggest mini-golf facility in the country, with four different options. Choose from ocean or nautical themed courses, one that features castles from around the globe or one that transports you to a lush jungle.